SHARDA Krishnamurthi, aka Kavita Krishnamurthy, was exposed to classical music and dance from a very early age. Her father, a government official, and her mother encouraged her to learn music since childhood. Jaya Chakravarty, Hema Malini’s mother, suggested Kavita that she sing for Bollywood and try her luck in filmdom. Though her father was apprehensive initially, yet later Kavita managed to assure him that she would complete her college education first. Kavita did her Bachelors in Economics from St. Xaviers’ College, Mumbai, which helped her get some exposure. Later, she came across Ranu Mukherjee, a singer and the late composer-singer Hemant Kumar’s daughter, who was her classmate. She introduced Kavita to her father. Kavita’s first recording was a Bengali film duet with Lata Mangeshkar in 1971. Hemant Kumar was impressed by her performance and gave her chance to perform on stage with him. Later she sang with Manna De. She was widely noticed in the TV music show — Aarohi, with Manna De and got chances to do jingles. After a long struggle, her major success was the song Hawa hawaii for the film, Mr India. Once on firm footing, she sang many songs for movies like Saaz, Mohra, Vinashak, 1942 - A Love Story, Eeshwar, Viraasat, Chaalbaaz, Gupt, Tere Mere Sapne, Hum dil de chuke sanam, Deewangi, Zubeidaa, Astitva, Moksha, Koi mil gaya and many more. This portal has a huge collection of Indian music. Movie and non-movie songs sung by Kavita Krishnamurthy are listed on this site. Some of the hit numbers of Kavita Krishnamurthi like Ilu Ilu, Dheeme Dheeme, Main Albeli, Saudagar Sauda Kar and many more are available on this site. All songs available here can be heard on real player. 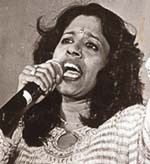 This site has a search engine that can be used to find songs sung by Kavita Krishnamurthy and other Indian singers. Apart from this, you can find Assamese, Bengali, Gujarati, Hindi, Kannada, Kashmiri, Malayalam songs, besides those of some other great Indian singers and musicians. This is yet another Website where you can find over 100 Kavita Krishnamurthy movies and non-movies songs. This Website has a user-friendly navigation, which makes it convenient for the user to select, search and hear the songs sung by Kavita Krishnamurthy and singers. The search engine is effective and helps in searching music. This Website is available in different languages like Hindi, Tamil, and Telugu. You will also find a huge image gallery of actors and actress here. Besides this, it contains some more nice stuff. One can also register on this site and avail e-mail facility.